The award-winning Ogline Design can help you reach, inform, influence, and connect with your intended audience. How? Build an authentic relationship that truly reflects your school  and welcomes students. Strategically placed stories that speak to the real “likes” and concerns of those who really want to know more about you but don’t always know how to find out or ask aspiring college students. You already know that high school students are deluged with information from colleges and universities  in their inbox and their mailbox. They receive thousands of letters, brochures, and e-mail messages during the course of their college search. How do you cut through all the clutter? In 2007, Ogline Design worked with TargetX to launch the CUPPIE award winning FACES for Albright College. FACES was a three-times yearly magazine that profiled students and used fresh, personal perspectives to tell the Albright story. The profiled students were featured bloggers on a private-branded social network as well as tour guides... making their stories accessible in-print, online, and in-person. FACES ran for six years, 18 issues, and 288 pages. How do we create creative that leads to higher conversion rates? We get to know and pay attention to the real needs of your market, your students  and we help you identify all of the ways that stories about your institution can bring new students into your community. The fact is, students want to find out more about youbut they don't usually find what they are looking for. Facts and figures and glossy photos just can't help prospective students picture themselves in your student center surrounded by a new group of friends with whom they can actually relate. Are you letting prospects know how you can help them? Consider the exciting discoveries of adult students who often find a direct route to a promotion or beneficial career change, as well as a network of like-minded professionals, and a renewed passion for learning, collaboration, and most of allwe’ve been toldlifelong transformation. Prospects need to see that they too can change their lives. That’s where stories come in. Aside from being there in person, there is no better way to relate than through the tried and true art of storytelling. When you consider the number of e-mails and letters students receive during the course of their college search experience, this is a vital, even mandatory distinction. Over the past eleven years Ogline Design has built and honed thousands of strategically-placed stories that work in tandem with leading-edge technology and design to enable clients to effectively target future students through carefully-crafted messaging and user-focused web design. Based on our experience, as well as our ongoing research and analysis of trends, we pair strategy and creativity to the development of content. Our team of account managers, writers and designers work together to craft creative that lets students know (and see) who you really are. Our results-driven insight goes beyond best-practices and serves as a multi-disciplinary approach to develop creative that is distinct to your brand and your institutional DNA. We spend the time to get to know you and your students so we can tell your story with detail and authenticity. What would you most like your prospective students to know about your institutions? What stories might help them see, hear and feel that information? Contact our award-winning team to discuss making your story a better story. 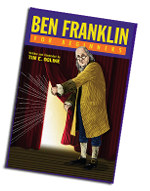 Ben Franklin For Beginners, written and illustrated by Tim E. Ogline, began shipping October 1, 2013. Ben Franklin For Beginners is published by For Beginners and distributed by Random House.